It’s a simple equation, and we know that as a musician, you’re not fond of math, but MasterControl really is the sum of its three distinct studio-management factors. MasterControl eliminates your need for individual analog and digital audio interfaces, speaker switching and routing units, mixing and transport-control surfaces, hardware volume controls, and more. The only piece of gear you need to input all of your sources into your DAW; the only piece of gear you need to control recording and editing; and the only piece of gear you need to run professional tracking and mixing sessions is MasterControl. We even throw in two powerful recording and production programs: Steinberg Cubase LE 4 and Ableton Live Lite 7. MasterControl is a 24-bit, 192kHz, high-resolution, low-latency audio interface. It is capable of nearly any input type and quantity, with a flexible and generous output section. It features low-latency FireWire computer connectivity for Mac and PC. The single cable carries all audio and control data from MasterControl to your DAW. MasterControl contains eight analog inputs. 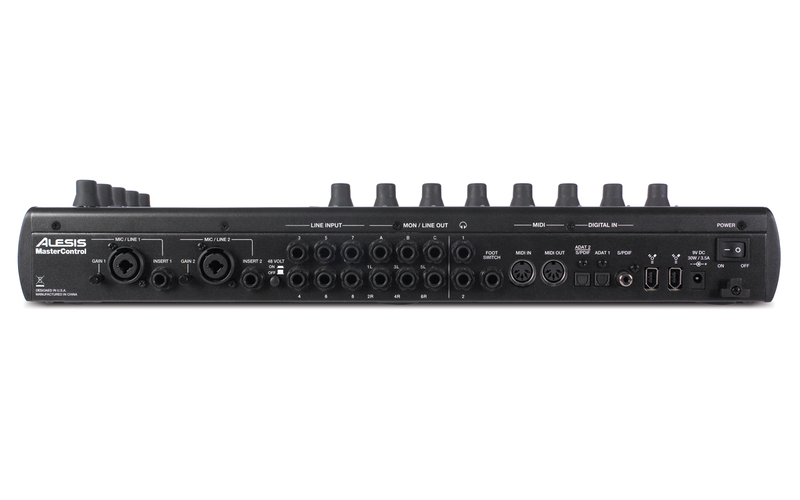 Inputs one and two offer XLR connection, high-definition, discrete-design preamplifiers, 48V phantom power, and channel inserts. Inputs three through eight contain 1/4" TRS, line jacks. MasterControl’s input section can be expanded to handle up to 24 simultaneous inputs, including dual ADAT Lightpipe, coaxial, and optical S/PDIF. Six analog outputs and 16-channel MIDI I/O further extend MasterControl’s impressive I/O capabilities. 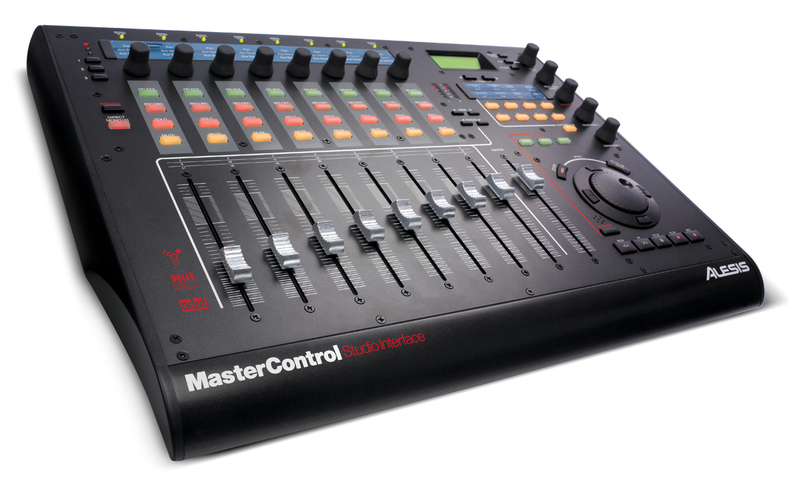 MasterControl contains hands-on controls for confidently running tracking and editing sessions. Multiple banks of assignable controllers enable access over 50 software parameters in real time. Nine touch-sensitive, 100mm, motorized, capacitive Alps faders deliver the hands-on mixing experience that mixing in software with a mouse simply cannot rival. 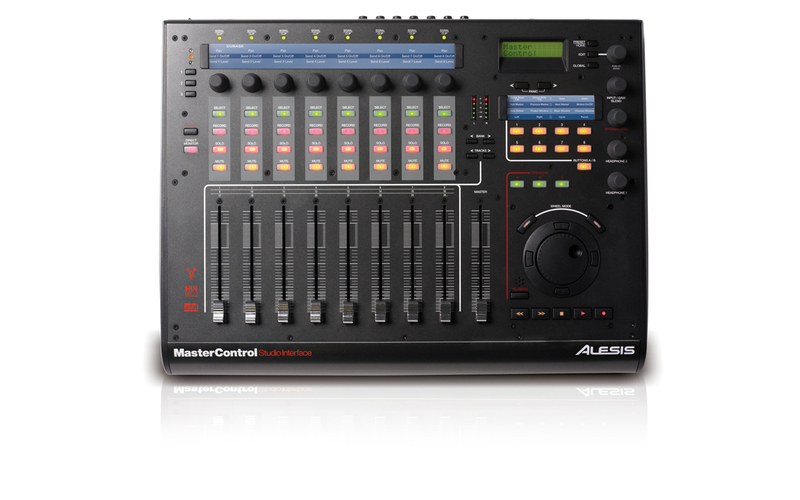 MasterControl has eight assignable knobs that access three control banks each and two banks of eight assignable buttons that access two control banks each. Dedicated transport controls and a multifunction jog wheel complete the tactile control package. MasterControl’s DSP-driven internal mixer enables hardware-direct monitoring with zero discernable latency. It employs the industry-standard HUI protocol for communication with all popular DAW software, and requires no mapping for seamless interoperation. Building upon the standard, MasterControl also enables editing of templates and presets for customization. A large, dedicated display provides real-time visual feedback of all actions, and preview button allows safe audition of controls prior to sending commands to the DAW. MasterControl’s built-in speaker switching enables you to easily switch between multiple sets of monitor loudspeakers for ease of mix-accuracy checks. An internal talkback microphone enables easy communication with musicians while tracking. Three pairs of independently assignable stereo outputs with dedicated, active mute buttons place the engineer squarely in the driver’s seat. With flexible, direct monitor routing, sources are assignable through any and all output pair(s). Dual, independently assignable stereo headphone outputs with independent gain controls further extend the output capabilities of MasterControl. The dedicated talkback microphone can be engaged from the control surface or using an optional footswitch. MasterControl employs an advanced DICE II chip with JetPLL™ technology for clock-stable firewire-audio streaming and routing. JetPLL nearly eliminates audio-band jitter, greatly improves imaging, and decreases digital noise, all of which combine to deliver peerless sync. As digital audio devices are added to a system, they increasingly create system-additive audio-band clock jitter. Variation between device clocks can actually fall outside the ability of some devices to cope, causing failure. JetPLL is extremely tolerant of wide variations in clock frequencies. Its hybrid design incorporates noise shaping to virtually remove audio-band jitter. This technology ensures the highest possible converter performance, resulting in better separation. MasterControl contains 114 dB, 24-bit, 192 kHz stereo analog-to-digital converters. Sampling, analog-to-digital conversion, and anti-alias filtering are performed by MasterControl’s 24-bit, stereo ADCs at sample rates up to 192 kHz per channel. They employ a 5th-order delta-sigma modulator followed by low-latency digital filtering, eliminating the need for external anti-alias filtering and providing excellent noise rejection. MasterControl also features 114 dB, 24-bit, 192 kHz multi-channel digital-to-analog converters. MasterControl’s uncompromising DAC system begins with digital de-emphasis, ATAPI channel mixing, digital-interpolation filtering, and an oversampled delta-sigma modulator. Audio is fed to the differential analog outputs through a multi-element switched-capacitor stage with low-latency IIR low-pass filtering. MasterControl comes with a powerful software suite for recording and sequencing. It includes Steinberg Cubase LE music production software with a full range of tools for audio and MIDI recording and mixing, and Ableton Live Lite, a production and performance program enabling you to create, produce and perform your music all in a single application. MasterControl is an HUI+ control surface, meaning that it is uniquely programmable with HUI and Mackie Control compatibility for use with all popular DAWs, virtual instruments, and other audio software on Mac and PC. Mackie and HUI and trademarks of LOUD Technologies Inc.